Fabric. You won't need much so this is a great project for any leftovers scraps you may have. Step 1: For a newborn bow tie, I cut out a 6 inch by 3.5 inch piece of fabric. Ironing between each folding step is recommended, but not necessary. Step 2: Fold both long edges in toward the middle and put a little hot glue there to keep it in place. Step 3: Fold both short edges in toward the middle and put a dab of hot glue there as well. This will be your bow tie. Step 4: Cut out a piece for the middle of the tie. Mine was 1 inch wide and about 5 inches long. The length doesn't really matter as much because you'll be cutting it off. Step 5: Fold the long edges toward the middle and put hot glue there like you did on the other piece. Step 6: Take the fabric from step 3 and fold it like the picture. Pinch with your finger and use hot glue to keep it in place. Step 7: Take the middle piece and hot glue that around the middle of the bow tie. 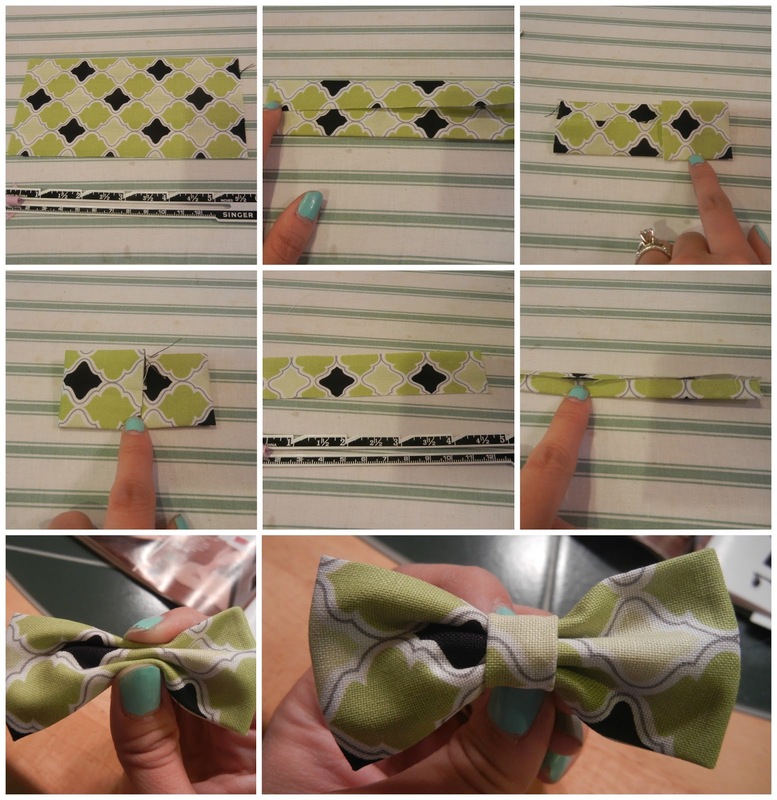 At this point, you can finish off the bow tie as is and fold the middle part around the back, cut off the excess and glue it down. Or you can add the bow tie to a clip, headband, etc. For my baby girl gift, I added a skinny elastic headband to it first before gluing the middle part down on it. For my baby boy gift, I decided to turn it into a necktie. Step 1: Cut a piece of fabric about 13 inches long and about 1.5 inches wide. I folded it in half to get a crease. Step 2: Fold the long edges to the middle crease. Step 3: Fold each short edge over and fold the whole thing in half. You'll basically have a strap at this point with no raw edges exposed. 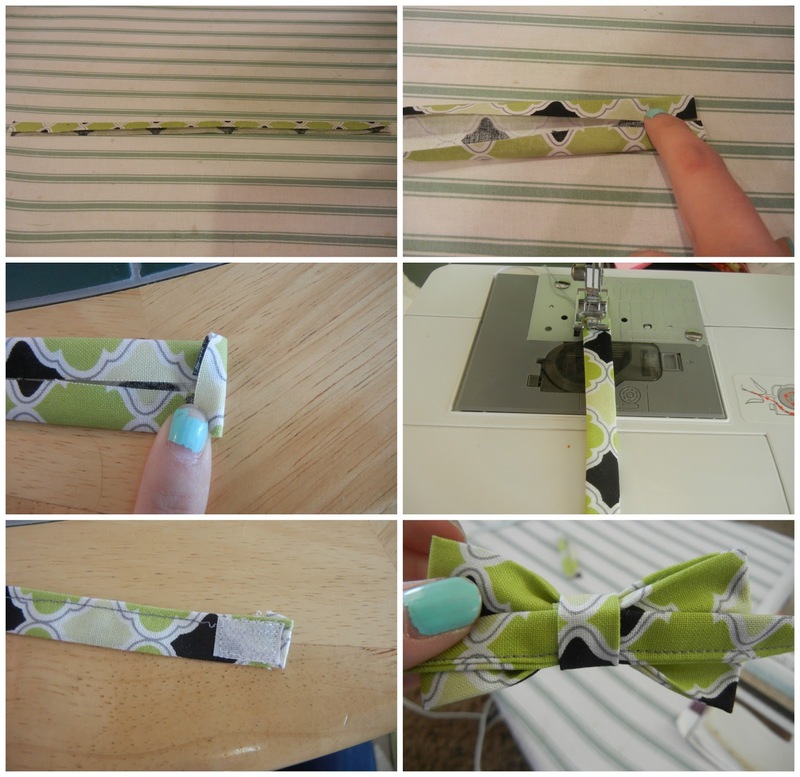 Step 4: Sew it all around. 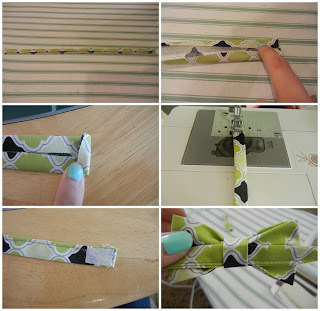 Step 5: Cut out a piece of velcro and put it on each side of the strap. Step 6: Before folding the middle part of the tie down, glue this strap in first and then glue the middle part down around it.